Premium Gold Lasertip, a tip which has a laser roughened surface which literally bites into the screwhead, reducing cam-out and eliminating the need for two-handed screwdriving. 1 - 0.6 x 3.5mm 100mm slotted. 1 - 0.8 x 4.0mm 100mm slotted. 1 - 1.0 x 5.5mm 125mm slotted. 1 - PZ2 x 100mm Pozi. 1 - ph1 x 80mm philips. 1 - ph2 x 100mm philips. 1 - 0.5 x 3.0 x 70mm Voltage Tester. Fully tested individually for dielectric strength under a load of 10,000 volts so as to ensure safe working with loads up to 1,000 volts. They have a significantly extended service life due to bit grade steel used in manufacturing. Patented Kraftform handle which is ergonomic, multi-component and which uniquely fits to the shape of the hand during screwdriver use, reducing fatigue and increasing speed. Smooth, soft zones offer improved grip, hard zones allow easy hand repositioning. "This can be seen in this demonstration video of a superseded set below but demonstrates the effectiveness of the handle and bit grip." 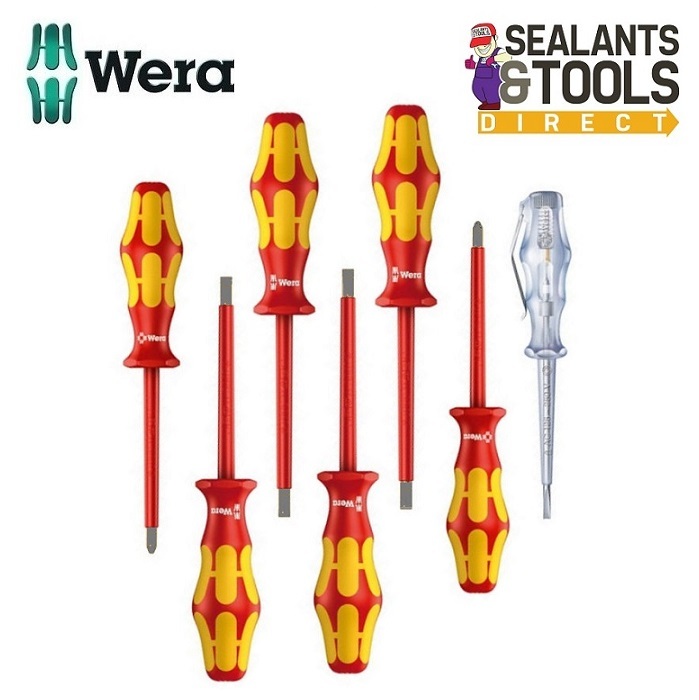 Video of the Wera VDE Electrical Insulated Screwdriver Set.